Archaeologists hard at work in center of Reykjavik. 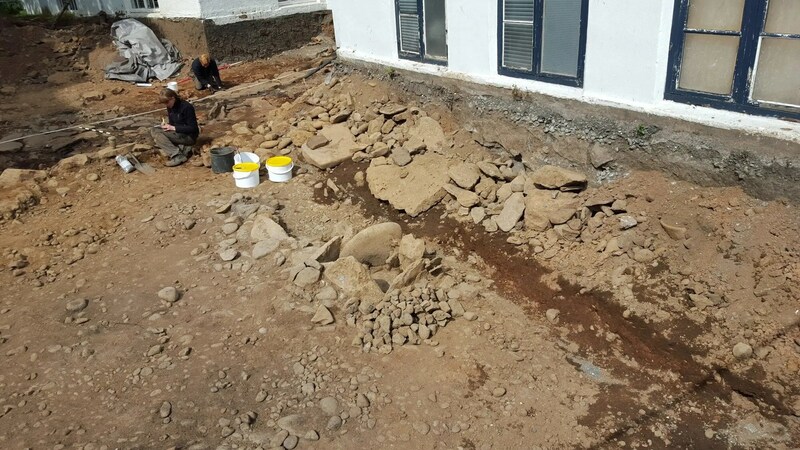 Archaeologists were in for a big surprise when they were researching the ground where a new hotel is going to built in Lækjargata street in the center of Reykjavik. They had expected to find buildings from the 18th and 19th century underneath this former parking lot but it quickly became apparent that something much more interesting was hidden in the soil. What they discovered was a large viking hall, not unlike the one that is on permanent display just up the road at the Settlement Museum. Although the final verdict of the age of this building is not in yet, the archaeologist I spoke believed it to be have been in use at the same time as the hall in the settlement museum. Should this guess be proven correct it demonstrates that the settlement in Reykjavik was undertaken by more people than previously believed. In the center of the image is the outdoor pot. The hearth is where the archaeologist is working. This hall is bigger than the one that is on display in the settlement museum, it could be up to 30 – 40 meter long,compared to the 16 meter long settlement museum hall. The hall has a large hearth, about 5 meter long which makes it the largest hearth found in viking age halls. The artifacts found in the hall include beads, spindle whorls and a silver ring. I was also impressed with an outdoor pot made out of rocks. It would work in a way where you would fill it with water and then heat rocks until they were glowing hot. The stones would be put into the water to make it boil and fit for cooking food. The future of the site is still being decided, it is unclear to what degree the viking hall will be preserved and visible underneath the new hotel building. You can view the archaeologists at work at this important site at Lækjargata but it is unclear when their work is done and the construction of hotel begins. You can see the site at Lækjargata street in the center of Reykjavik.